Roarrrrrrrr! You'll see this colorful little dinosaur coming! 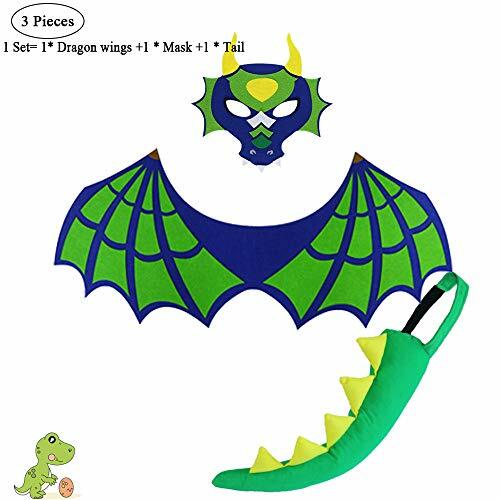 Make playtime magical with this cuddly dinosaur wings cape cape and mask set. If you have a dinosaur crazy kid in your life, make their prehistoric dreams come true with this roarsome awesome cape! 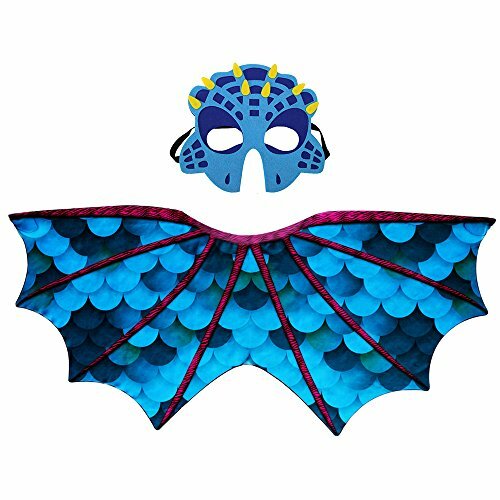 This dinosaur wings cape and mask set make the perfect costume accessories for your child too play in their imaginary world. -------Made to fit ANYONE---------- ♥ 100% Chiffon, felt ♥ Red,Green,Blue, Rose dinosaur-like wings cape and mask costume set ♥ Essential Costume: Dragon, dragon rider, fictional character, fairy tale,playing dress-up, as a comfy Halloween costume, a hit at theme parties or as a whimsical cover-up or poncho. ♥ Safety tested for ages 3+, sized to fit most kids around the shoulders with elastic straps. Children love wearing it. Everyone else loves seeing it worn. 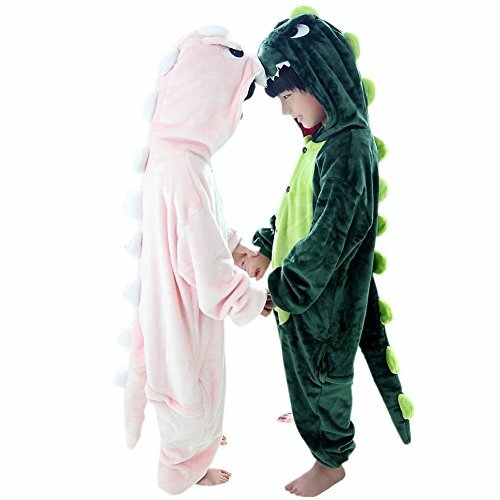 Ideal for a little dinosaur (or dragon) fan! Whether for pretend play or a costume party, this cape will be the perfect finishing touch.Masks and tails and other awesome accessories can be ordered to match too! Have a beautiful day!! 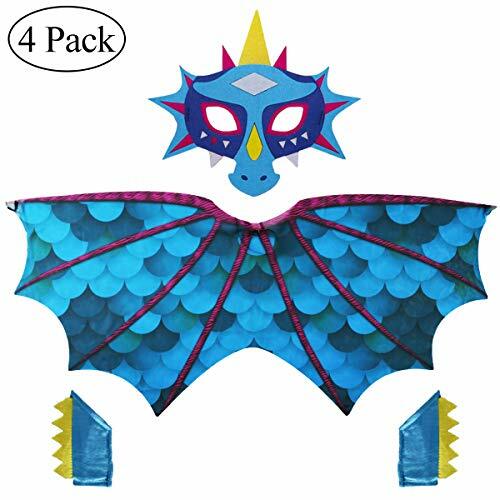 Specifications: Material:feltDimension:Dimension Wing: 60x28cm(23.6x11inch)Dimension mask: 23x21cm(9x8.2inch)Weight net: 50g/packColors:Blue, yellow, green, sky blue(shown in pictures)Package included:4x a set of mask and wingWarm tip:Please refer to the measurement. Tiny measuring error is allowable in normal range.Welcome to Dragon garden!Here you can make the most of your imagination,you are a dinosaur that crossed from Jurassic to 2018? you are a magical dinosaur that can fly to the clouds? Anyway, these four styles of masks will bring you and your friends endless happiness.Our Sincere Thanks:Thank you very much for visiting us. If you have any needs, please contact us and we will do our best to serve you.Welcome asking for a wholesale price if you want to buy more. ✅Are your little more of a dinosaur fan? 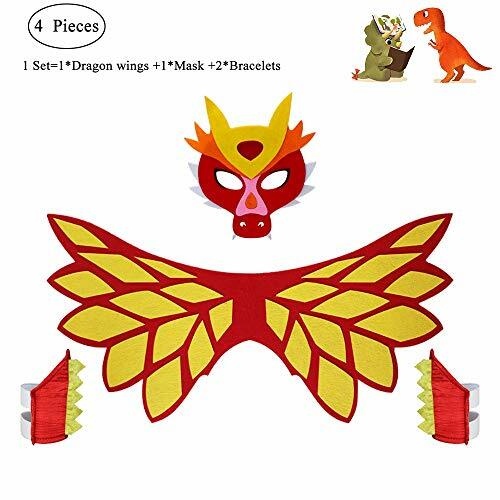 ✅They can't wait to putting these dinosaur tail and wings mask Bracelets on with lots of stomping and roaring? ✅Dressing up! Running about growling out being a dragon. ✅The brightly coloured tails will bring hours of fun to your little monster! ✅it will create the perfect monster addition to their wardrobe! 100% SATISFACTION GUARANTEE: We aim for 100% customer satisfaction. If there are any problems with your superhero set, please let us know. We provide easy refund possibilities and timely shipping. ✅Click Add to cart now! Welcome to Dragon Land! What dragon party would be complete without a bunch of dragons running around??? An awesome dragon party with these kits will inspire your visitors! Whatever your child's imagination can come up with. 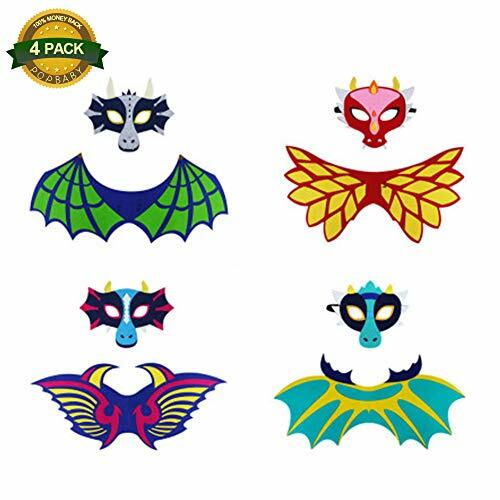 Whatever the occasion, dragon wings make it more fun!And in black, they could be bat wings.... See?Help your child foster their imagination with wings! 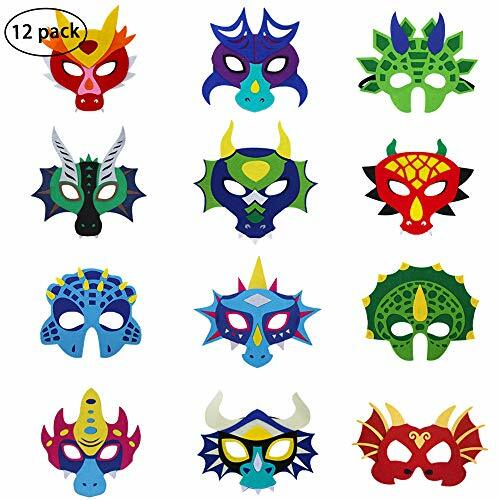 Great for ： --Dino or Dragon birthday party --Decorating Kids Bedroom --as party gifts for your grandson, nephew --Dragon wings & masks, perfect for dress-up, Your Kids Masquerade, Halloween or just everyday whimsical pretend play CARE INSTRUCTIONS : Felt material allergy is used with caution. 100% SATISFACTION GUARANTEE: We aim for 100% customer satisfaction. If there are any problems with your superhero set, please let us know. We provide easy refund possibilities and timely shipping. If your honest about what your purchasing here you won't be disappointed.Hurry Up to add to cart or you might miss it. ✅Are your little more of a dinosaur fan? 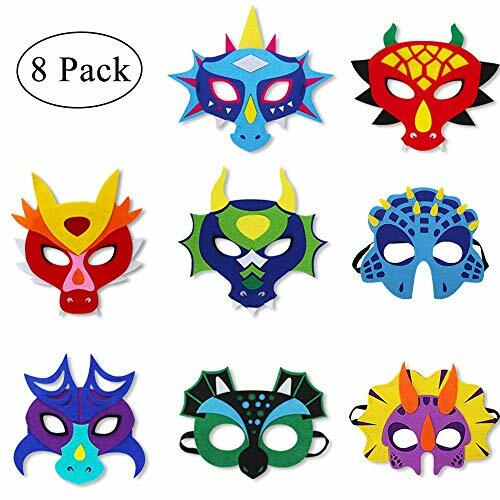 ✅They can't wait to putting these dinosaur masks on with lots of stomping and roaring? ✅Dressing up! Running about growling out being a dragon. ✅The brightly coloured tails will bring hours of fun to your little monster! ✅it will create the perfect monster addition to their wardrobe! 100% SATISFACTION GUARANTEE: We aim for 100% customer satisfaction. If there are any problems with your superhero set, please let us know. We provide easy refund possibilities and timely shipping. ✅Click Add to cart now!